Spend enough time in the workplace and eventually you have to deal with the stakeholder who drives you crazy. Whether full-time or just under certain circumstances, their irrational behavior becomes a thorn in your side. How do you deal with these people? 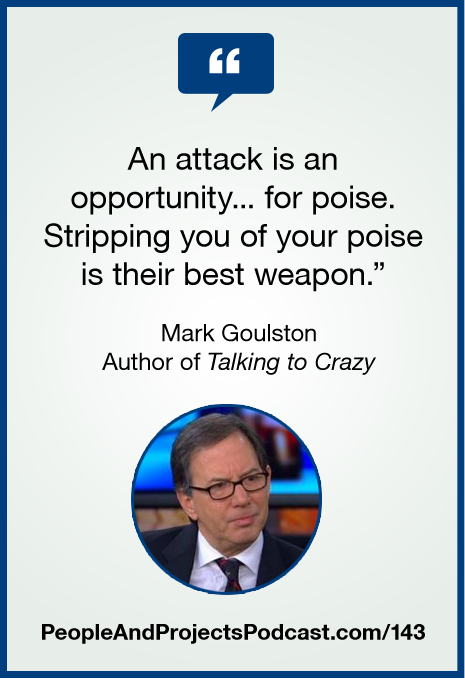 Though there are no simple answers, Mark Goulston shares his insights in his new book entitled Talking to Crazy: How to Deal with the Irrational and Impossible People in Your Life. To learn more about Mark, please visit his website at: http://goulstongroup.com/. We have just launched our project management e-learning on a new platform, and to celebrate, we're making the first 25% of the learning free! Learn more at http://courses.i-leadonline.com. Thank you for joining me for this video episode of The People and Projects Podcast! Have a great week! DOUBLE DRIFT by Kevin Macleod Licensed under Creative Commons: Attribution 3.0 License. CAREFREE by Kevin Macleod Licensed under Creative Commons: Attribution 3.0 License.